Blurb was looking to widen the top of their purchase funnel and ultimately increase revenues by increasing registrations. 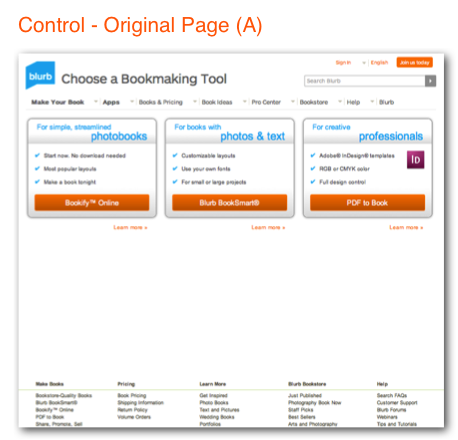 Blurb knew the site was not converting at its potential, and reached out to Blast Analytics & Marketing to setup proper analytics tracking and analyze blurb.com to identify weak links in their purchase funnel. After overhauling Blurb’s analytics configuration and implementing Adobe Target, Blast performed a detailed site analysis to identify and prioritize opportunities for improvement. 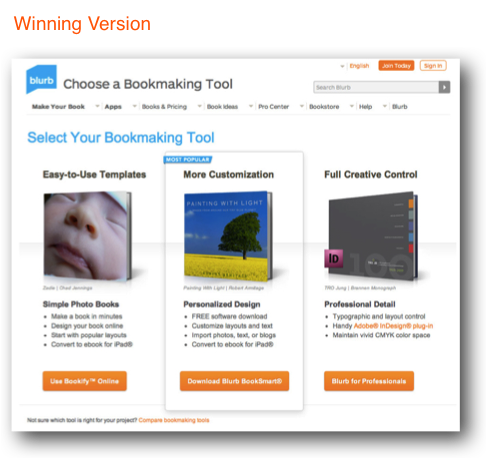 The funnel step that stood out as seriously underperforming and offering the most potential impact was the “Choose a Bookmaking Tool” page. By helping users make an easier and faster decision on what tool best fits their needs Blast hoped to minimize time, wasted steps, and frustration. By implementing and learning from different variations, Blast was able to create the optimal page that clearly communicated key tool benefits and positively influenced micro and macro-conversions. By making the choice simple for visitors and using Life Time Value (LTV) analysis based on tool pathway/conversion, Blast was able to significantly increase registration value and overall revenues.